Federal Reserve Chairman Ben Bernanke has done it. He has succeeded in creating a new housing bubble. By driving mortgage rates down to the lowest level in 100 years and recklessly printing money with wild abandon, Bernanke has been able to get housing prices to rebound a bit. In fact, in some of the more prosperous areas of the country you would be tempted to think that it is 2005 all over again. If you can believe it, in some areas of the country builders are actually holding lotteries to see who will get the chance to buy their homes. Wow – that sounds great, right? Unfortunately, this “housing recovery” is not based on solid economic fundamentals. As you will see below, this is a recovery that is being led by investors. They are paying cash for cheap properties that they believe will appreciate rapidly in the coming years. Meanwhile, the homeownership rate in the United States continues to decline. It is now the lowest that it has been since 1995. There are a couple of reasons for this. 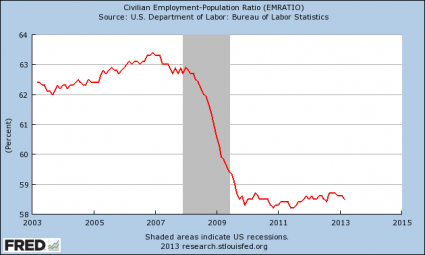 Number one, there has not been a jobs recovery in the United States. The percentage of working age Americans with a job has not rebounded at all and is still about the exact same place where it was at the end of the last recession. Secondly, crippling levels of student loan debt continue to drive down the percentage of young people that are buying homes. So no, this is not a real housing recovery. It is an investor-led recovery that is mostly limited to the more prosperous areas of the country. For example, the median sale price of a home in Washington D.C. just hit a new all-time record high. But this bubble will not last, and when this new housing bubble does burst, will it end as badly as the last one did?